Text and images Copyright (C) 2002 Dov Grobgeld and may not be used without permission of the author. Editor’s note: since this tutorial was published, the old GIMP Script-Fu interpreter (SIOD) has been replaced by a newer and better one (TinyScheme). A Script-Fu migration guide is available. 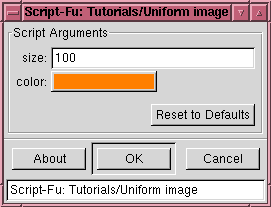 One of the wonderful features of GIMP is that it all its functionality may be accessed through scripting. The major scripting language for GIMP that has been attached to it today is Scheme. This document will try to be a brief introduction to Scheme, just teaching the essentials in order to write Script-Fu scripts, without getting into the programming language theory that is so typical of other Scheme references. The ‘ sign is necessary in order to tell Scheme that this is a literal list. If the ‘ was omitted Scheme would try to look up a function with the name 255 and send it the two parameters 127 and 0, which is obviously not what we want. A list in Scheme is always composed of a head and a tail. The head is the first entry in the list, and the tail is the rest of the elements in the list. This means that the list (255 127 63) really means (255 (127 (63 ()))) but Scheme allows the previous form as a shortcut. The car function is used to return the head of the list and the cdr (usually pronounced cudder) is used to get the tail of the list. To get the blue component of a color it is necessary to apply the cdr function twice and then the car function. For the Script-Fu writer one of the most important uses of the car function is to access the returned values from the built-in GIMP functions. All gimp-functions return a list, and even if the list contains only one element it must be accessed by car. This is e.g. the case for the important functions gimp-new-image and gimp-new-layer used below. More experienced Scheme programmers mostly use local variables instead of the global variables described above. This is considered better programming practice and this construct should be recognized in order to be able to read others Script-Fu scripts. Here a and b have a local scope and retain their values only up to the closing paren matching the one before let* . 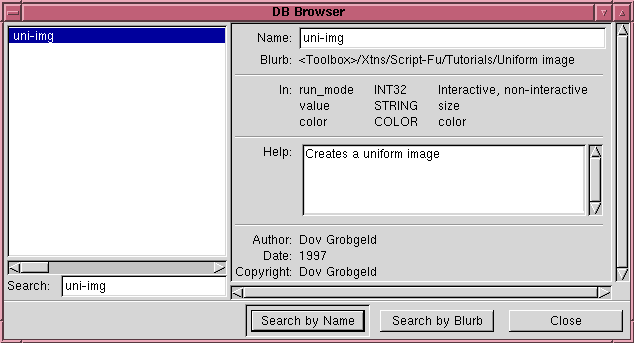 All functionality of GIMP is available through the procedural database (PDB). Each procedural database function has a corresponding Scheme function mapping. E.g. 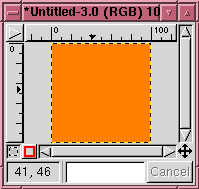 produces a new GIMP image of type RGB and size 100x150. For the Script-Fu programmer this information shows that uni-img may be called with three parameters of the types INT32, STRING and COLOR. The different types will be explained below. Tell Script-Fu the type of parameters the script takes and give these parameters default values. Give the script a name to be used as the menu label. Register the script as a command in the PDB. The last point above actually means that a script is from Gimp’s viewpoint in no way different from a built-in command or a plugin command. As long as a command is registered in the PDB it can be called by any script or plugin. The name of the script to be used as a menu entry. A help string describing the function of the script. List of valid image types for the script. This only has a meaning on scripts operating on images that already exist. A true or false value. A string of characters enclosed in double quotes. Any scalar value, integer, or floating point. A label for Script-Fu to display when querying for the parameter. The following script uni.scm receives two parameters from the user, the size of the image and a color, and goes on to produce a uniform image of the requested size and the requested color. Not very useful, but it shows the essential steps in producing a Script-Fu script. ; and layer and may paint in the layer through the PDB functions. ; Finally register our script with script-fu. 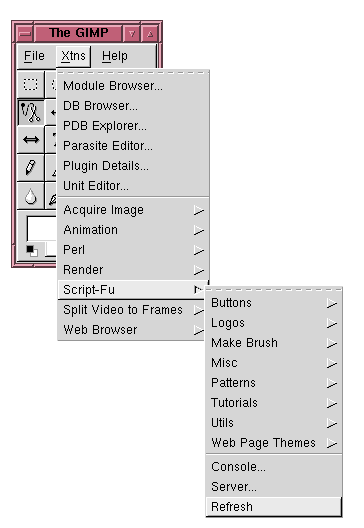 then the script will be available through the GIMP menu that is launched by the right mouse button over an image. Such script must also have as their first and second argument a SF-IMAGE and a SF-DRAWABLE. Here is an example script which copies the current layer to a new layer, blurs it and inverts it. ; An example script that blurs an image according to a blur radius. ; how a plug-in may be called. "Copy and blur a layer"
This procedure fills the specified drawable with the fill mode. If the fill mode is foreground, the current foreground color is used. If the fill mode is background, the current background color is used. Other fill modes should not be used. This procedure only affects regions within a selection if there is a selection active. This tool creates a rectangular selection over the specified image. The rectangular region can be either added to, subtracted from, or replace the contents of the previous selection mask. If the feather option is enabled, the resulting selection is blurred before combining. The blur is a gaussian blur with the specified feather radius. When pasting an image from the clipboard, or when creating text in a a drawable, the result is not put directly in the drawable. Instead it is put into a special temporary layer known as a floating selection. The floating selection may be manipulated in several ways, and finally it is merged into its associated layer, a process known as anchoring. ; be carried out if an undo command is issued. ; Create the text. See the Procedure Browser for parameters of gimp-text. "Write Hello World in the current image"
This script shows another feature we haven’t mentioned before. The possibility of creating an undo group. All the commands between the commands gimp-undo-push-group-begin and gimp-undo-push-group-end are undone together if the undo command is issued. To copy a selection, the command gimp-edit-copy is used. It places a copy of the selection contents in the cut-buffer. The contents of the cut-buffer may then be pasted into a layer, the same layer or another one, and it is then pasted as a floating layer. In the following example the selection is copied, pasted into the same layer, offset a fixed distance, finally anchored. Try it by drawing a small blob in the middle of the image, select the blob, and then call this script. ; An example of how to create a floating layer and how to ancor it. "Copy the selection into the same layer"